This month at Technique Time Tuesday we are learning to make a Dahlia Fold Flower. These are really so beautiful and versatile. Mynette has created a. Video tutorial which is very easy to follow. You will be making these in no time flat! Have your hand at it and then link your project us at http://mynnettestechniquetuesday.blogspot.com/?m=0 to have a chance to win a lovely prize from one of the Crew! Beautiful card Adrienne! Perfect for our challenge this month. Thanks for joining us at Stamping Sensations. Love your origami flower. And the card is just darling. 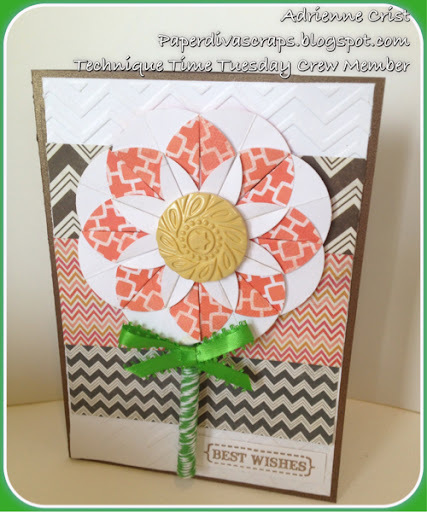 Thank you so much for linking atmLove to Scrap challenge blog. What a stunning flower on your pretty card Adrienne. love the flowers! great inspiration! thanks for sharing with us over at SEM! Very Creative. Thanks for playing at Love To Scrap. Awesome card.. Love your flowers..
Love you flower great colour pallet. Thank you for joining is at the crafty bloggers network. How cute is that! Love that dahlia. So glad you joined the EE team! This is a clever use of folding for the dahlia flower. I love the various patterns and textures in the background and the gorgeous button for the flower center. Thanks for joining our Floral Delights challenge at Craft Your Passion. I hope we see you again soon. I am in love with your card, what a little ray of sunshine! Such a pretty card, beautifully made. The flower is gorgeous. Thank you for sharing it with us at Stamping Sensations this month. So clever and pretty! Thanks for joining us at SEM! 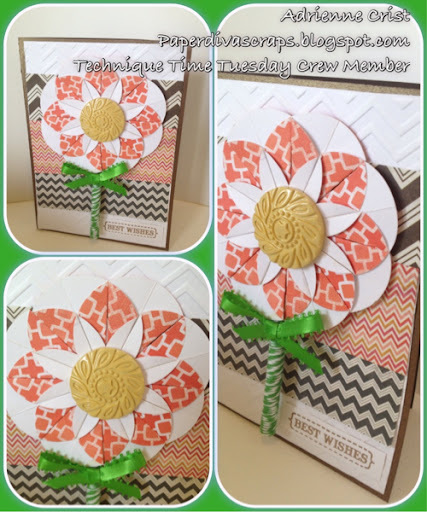 What a great card.Love the flower and the fab background of different papers with the same zig-zag pattern.Thank you for joining us at the Kraftyhands Challenge. So creative!! Thanks for playing along with us at Loves to Scrap!! Beautiful card and fun technique, thanks for playing along with us at SEM! Cool technique. Thank for playing with us at SEM Challenge! Super cute card---that flower is adorable! Thanks for joining in our challenge this month at SEM! !